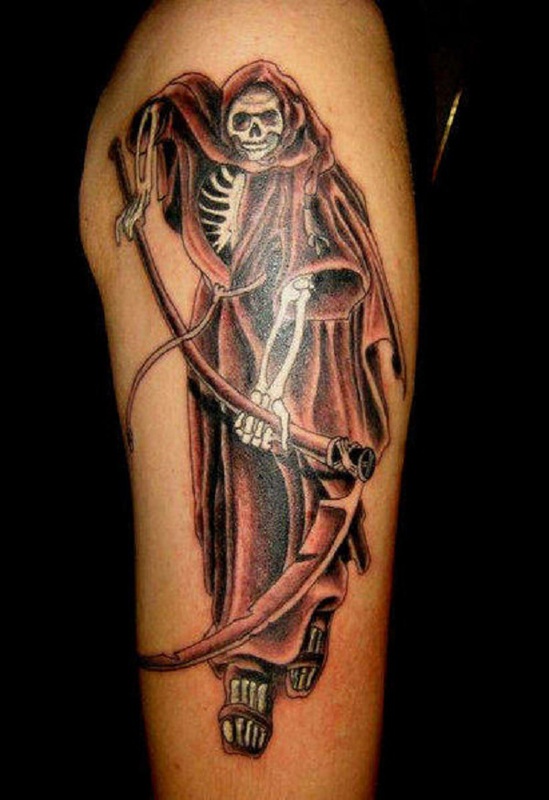 When you say that you want a tattoo that could kill by the looks then what you may be looking for an awesome Grim Reaper tattoo. 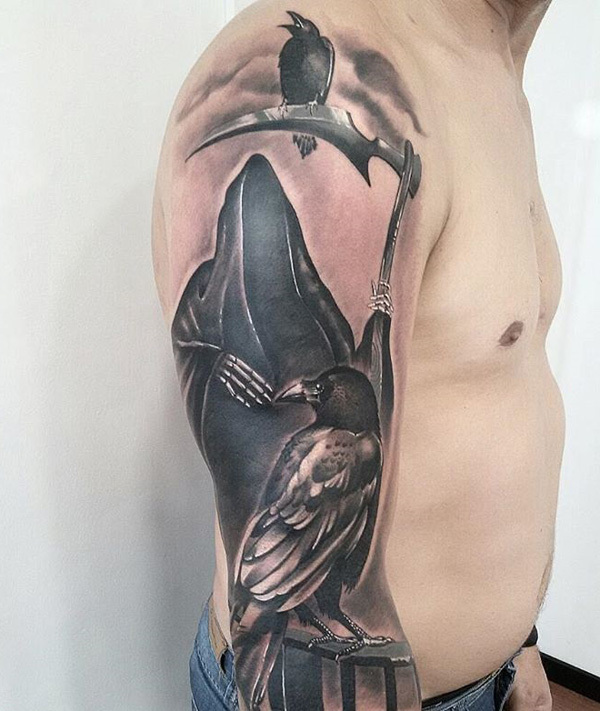 These Grim Reaper tattoos look incredibly artistic and dark. When you hear about the Grim Reaper the first though that comes into your mind is death. This is normal because in countless media the Grim Reaper is assumed to be the creature who stalks a person’s soul who is about to die. The Grim Reaper has been popularly depicted even in the ancient art as well as in literature. They have been around for years and thus many people have believed in them. The Grim Reaper is normally presented as having a long black cloak, a tall and sharp scythe and a skeleton face. The Grim Reaper can be very scary to look at and in some depictions is even shown to have a viciously eerie smile spread across its bony face. In other art forms the Grim Reaper is shown to be silent, lurking and emotionless. Since the Grim Reaper does make a unique Grim Reaper a lot of people have wanted one of their own despite the crazy and creepy stories behind the creature. 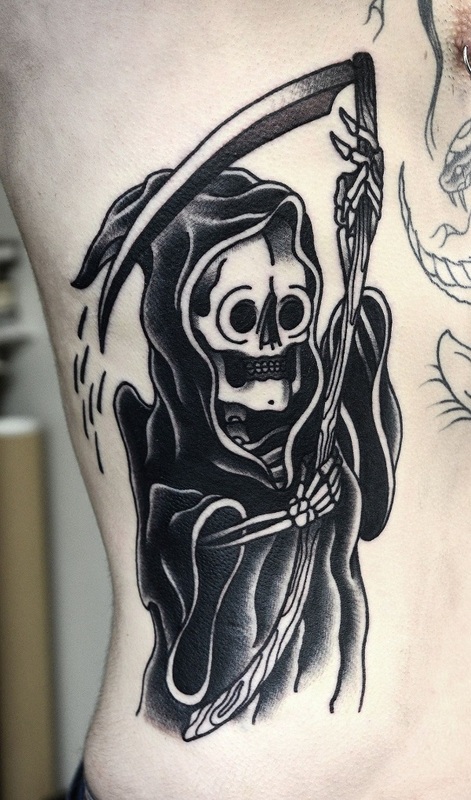 A lot of Grim Reaper tattoo designs are also out of this world and simply mind blowing so one can’t really blame them if people start loving them. Now that we are aware of what the Grim Reaper stands for, it’s time to know why they appear. It is believed that one meets the Grim Reaper before his or her death. The Grim Reaper is basically invisible to the naked eye and can only be seen by people who possess the ability to see spirits and of course those who are about to die and are torn between the land of the living and the dead. The scythe is then used to separate the soul from the human body as the Grim Reaper accompanies them towards the gates of hell or to their final resting place. Even though there is a common depiction of the Grim Reaper there are some versions that slightly differ from another. It’s not only because of the different beliefs that are placed on the image but there are also different ways wherein people want to perceive the Grim Reaper. 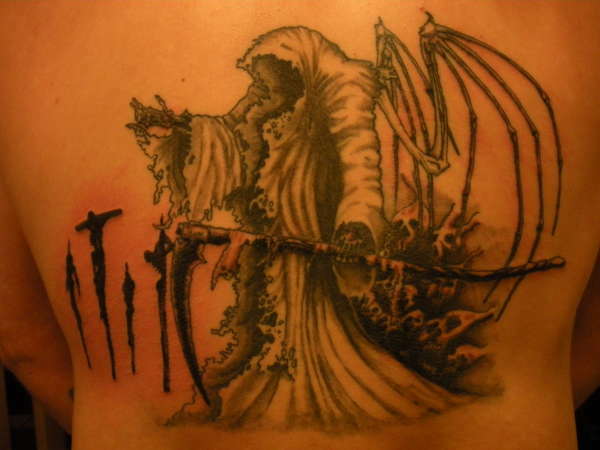 The regular Grim Reaper tattoo version is the one with the long hood and a scythe by its side. However the different strikes when the reaper holds its scythe. There are Grim Reaper tattoos that have the reaper carry the scythe on its shoulders and some are carrying it in front of the body. Another thing to note is the length of the robe, some choose to show a bit of the face and some choose to show the end of the foot. 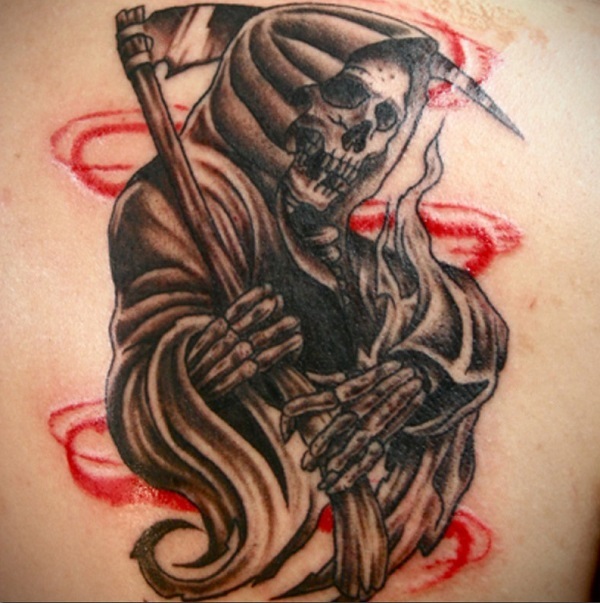 Grim Reaper tattoos often show that the reaper’s face as a skull, however there are also some versions that show the reaper as faceless; this means the hood frames a black and abyss like darkness inside. Usually the scythe is always long and taller than the reaper. Due to the dark nature of the Grim Reaper, the creature is often drawn in dark and gloomy colors such as gray, black and any related shades. 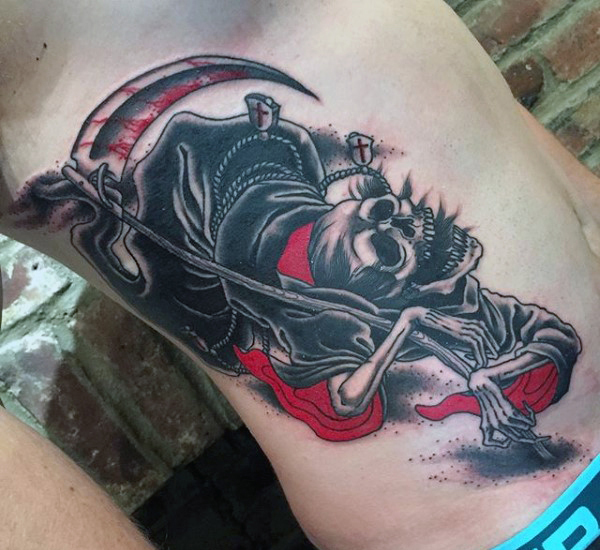 However because more and more artists are working on making unique Grim Reaper tattoos, the reapers have become more linked with vibrant colors and has become quite popular. 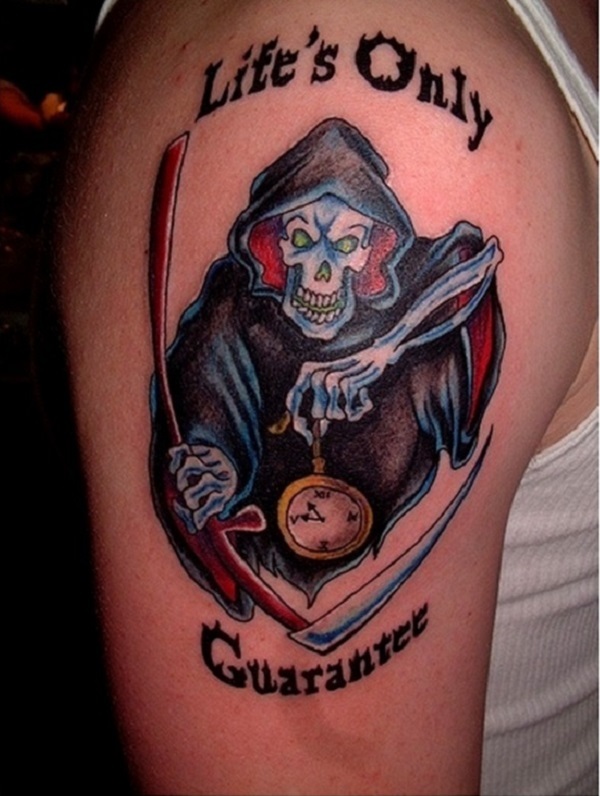 Nowadays it’s common to see Grim Reaper tattoos that are in full color. The story of the Grim Reaper can actually be traced back to the Christian Bible. The reaper is associated with what you call as the four horsemen in the apocalypse that can be found in the book of revelations. The fourth and last horseman actually represents death and he usually rides a pale horse while carrying a scythe. 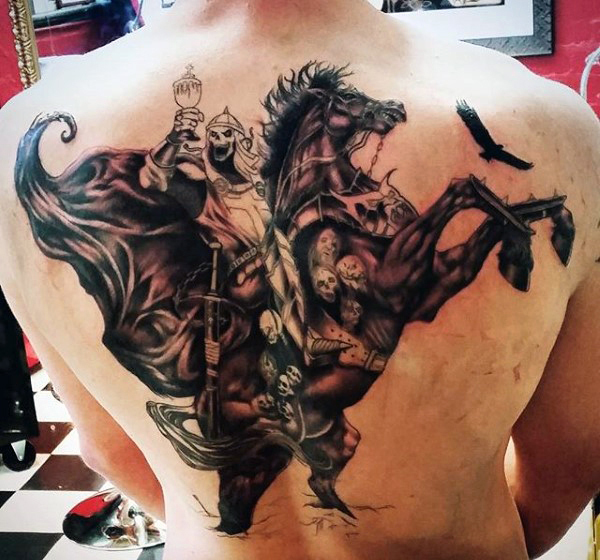 This is why you can also see Grim Reaper tattoos showing the reaper on a horse. Despite the popularity there are those who still see the Grim Reaper as a negative sign or something that signifies evil. However that depends on the culture since some view the Grim Reaper in a much lighter way than the others. For example in Roman mythology, the Grim Reaper as a collector of souls is shown to be more positive and can even depict good luck. The common ground is that the Grim Reaper will always be linked with death. Apart from the concept of death the Grim Reaper also conveys the cycle of life in some way. It’s because as we live death is something that we have to face sooner or later. It’s something inevitable and will happen to everyone in order to conclude their life spans. Having the Grim Reaper tattoo signifies courage and bravery because of how you choose to face the concept of death and meeting your fate eventually. A lot of the time the Grim Reaper tattoo can be seen on soldiers. In pop culture the Grim Reaper tattoos can be normally seen on Goths, rockers and the likes to show a unique and fierce looking design. The Grim Reaper tattoo is also so close linked to these cultures that sometimes it will be a loss if one does not have the tattoo while living the lifestyle because of how it perfectly fits physically and spiritually. 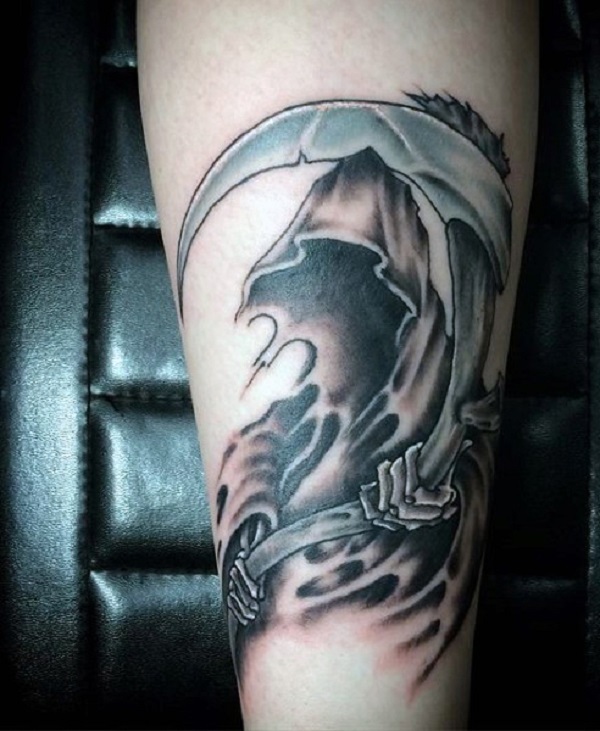 A black inked Grim Reaper tattoo with the scythe. This is the classic Grim Reaper design that people have been familiar of. The slight face of the reaper is shown and it gives you a glimpse of the skeleton face. 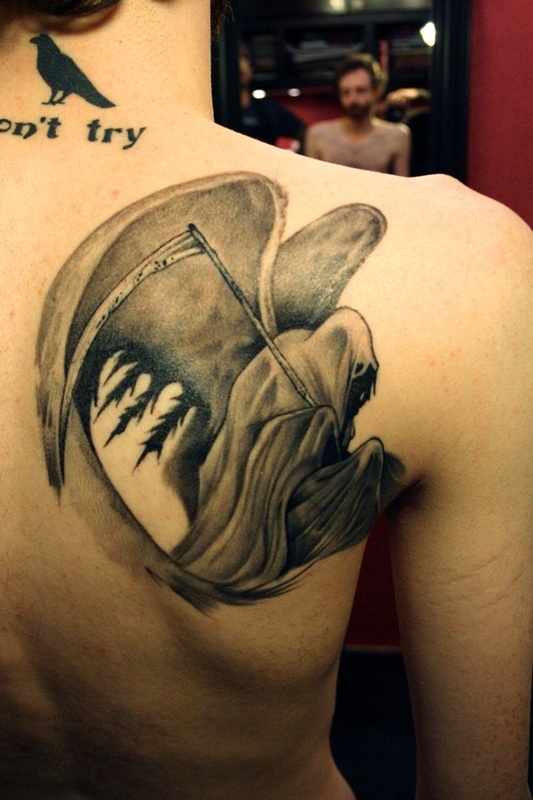 A faceless Grim Reaper tattoo. 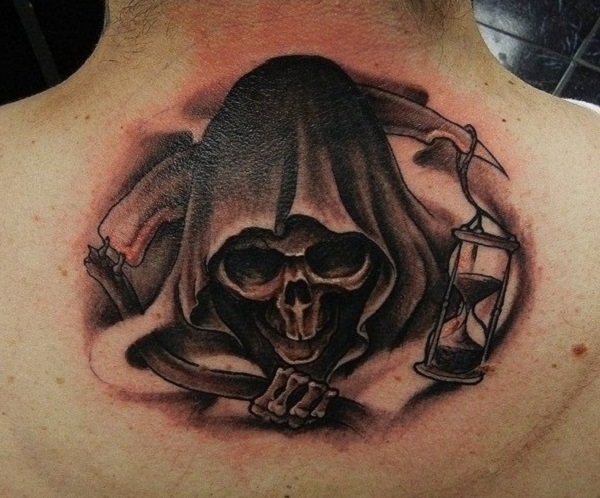 On this tattoo, the Grim Reaper is seen to be holding the scythe by the side while holding onto a clock in the background. The face is also covered with some kind of cloth. 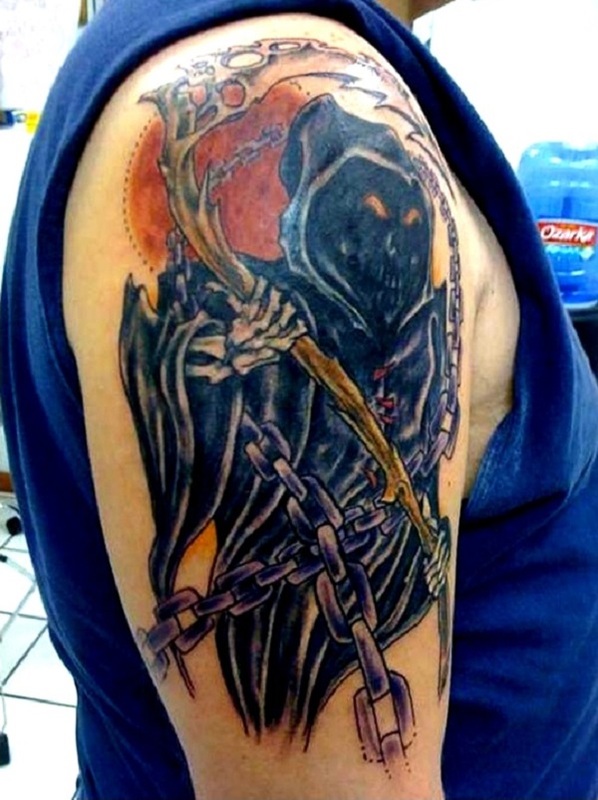 Grim Reaper tattoo with a faceless reaper. It is also shown that the reaper is sitting down on a thrown of death seemingly waiting for the fate of the souls to end. A headshot Grim Reaper tattoo. 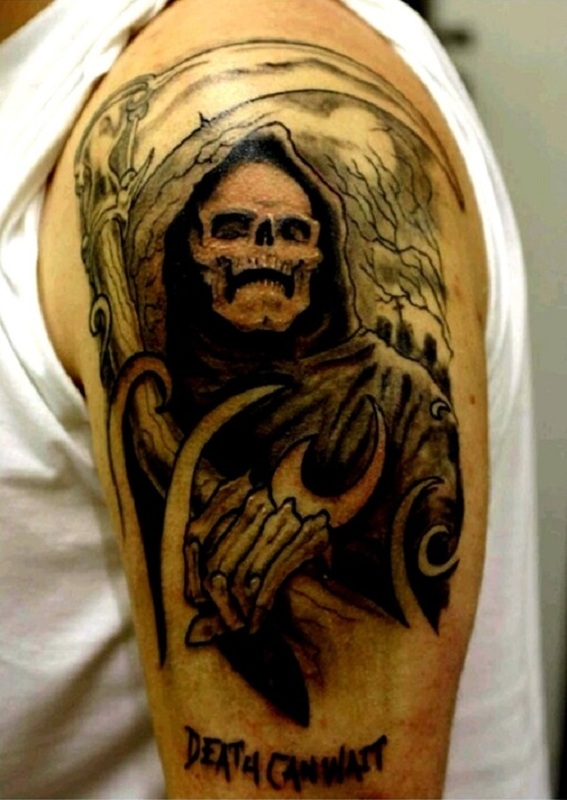 The tattoo shows the entire skull face of the Grim Reaper while holding a scythe. Simple, small but still terrifyingly unique. Grim Reaper tattoo in full and bold colors. Gone are the days were the Grim Reapers would always look dull and bleak, bright and red colors are also a trend now and helps instill more fearful expressions on the reaper. A really dark and meaningful Grim Reaper tattoo design. You can see that the Grim Reaper is seemingly waking along a certain path while looking down on a town with a lamp. 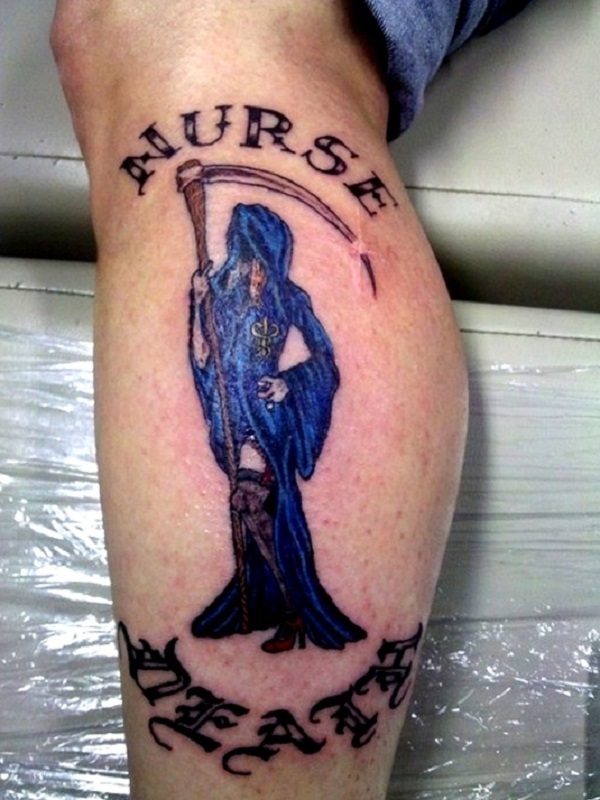 One of the more creative Grim Reaper tattoos. The Grim Reaper is seen to be crouching down and holding the scythe while spreading wings. 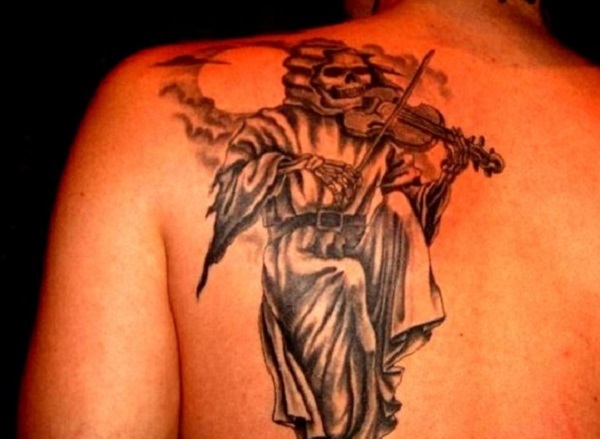 Not all Grim Reaper tattoos have wings and it surely makes this own truly interesting to look at. 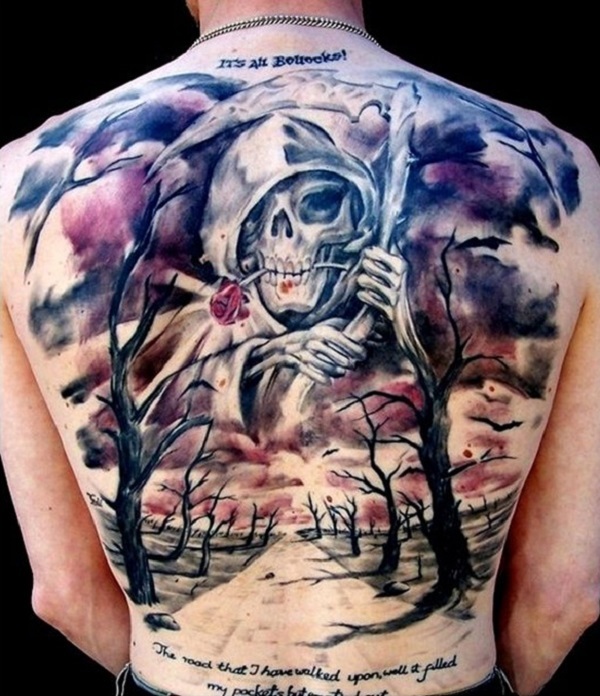 A beautiful and artistic depiction of a Grim Reaper tattoo. The Grim Reaper is devoid of the iconic cloak but retains the scythe. The Grim Reaper’s body is shown to be full skeleton as it holds up the head of a dead person covered with luxurious beads and accompanied by a blue butterfly. 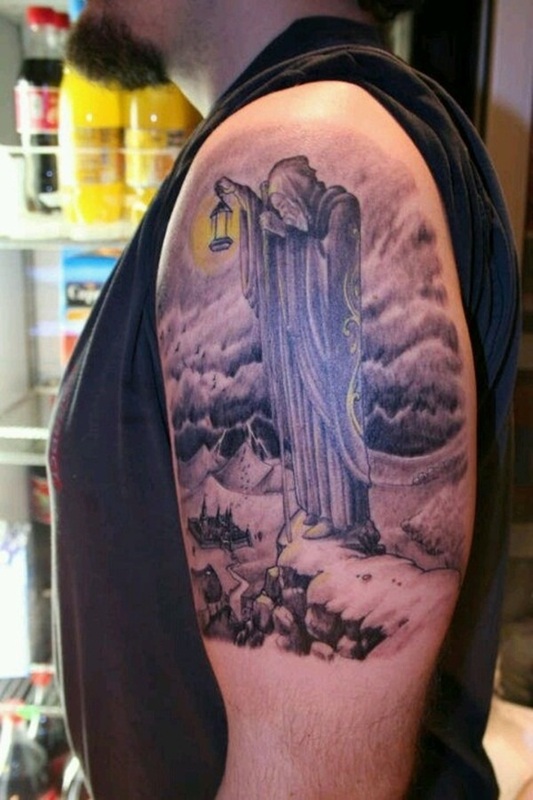 Faceless Grim Reaper tattoo. The face of the Grim Reaper is focused and instead of a face all one can see is a void of endless darkness as its bony hands hold the scythe. A Grim Reaper tattoo in full body. The Grim Reaper is seen to be walking way from a dead tree; he is seemingly going out to hunt more souls for the dead. Grim Reaper tattoo in black and red ink. The reaper is seen to be showing its bony face and hands while holding the scythe by his side. Behind the reaper is blood like swirls. 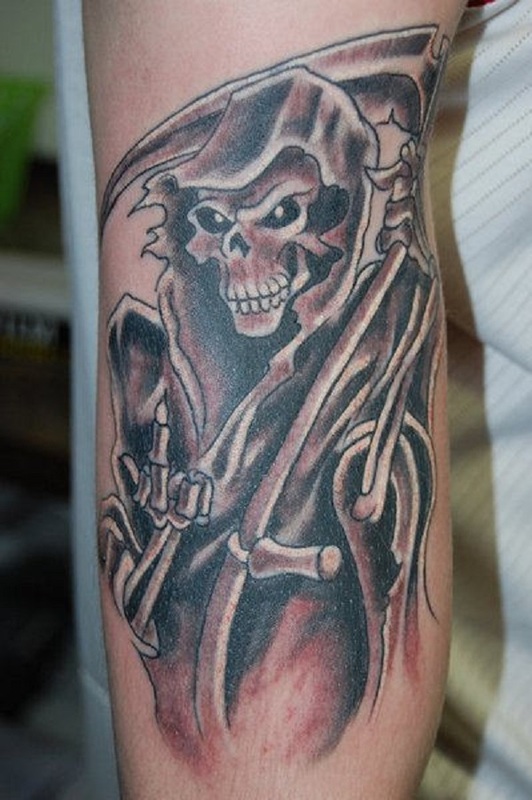 Grim Reaper tattoo on the arm. The reaper is seen to be beckoning you to come nearer. It’s like the reaper wants you to come and confront your fate. 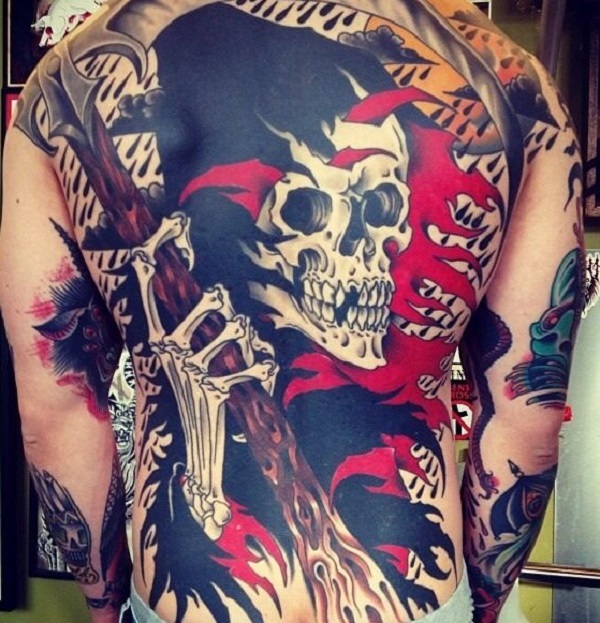 Majestic full back Grim Reaper tattoo. The reaper is seen to be running through a black horse amidst a raging fire. The reaper is also carrying a bunch of skeletal heads perceived to be former dead people whom they have accompanied to death. Colorful Grim Reaper tattoo. 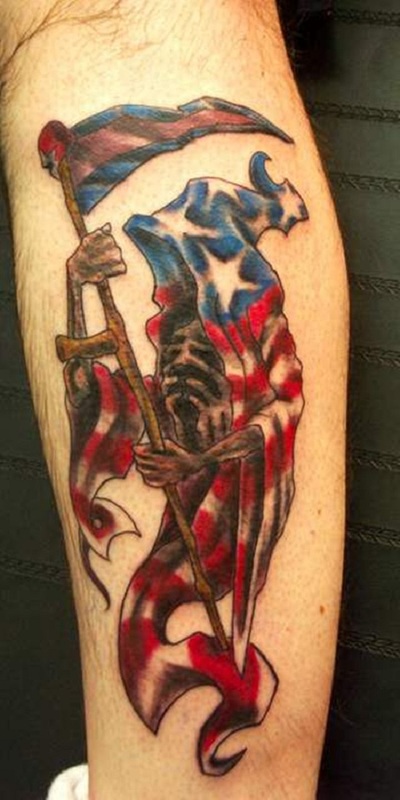 The reaper on this tattoo is wearing a rather unique cloak that resembles an American flag. Even the blade of the scythe is also colored in the likeness of the American flag. 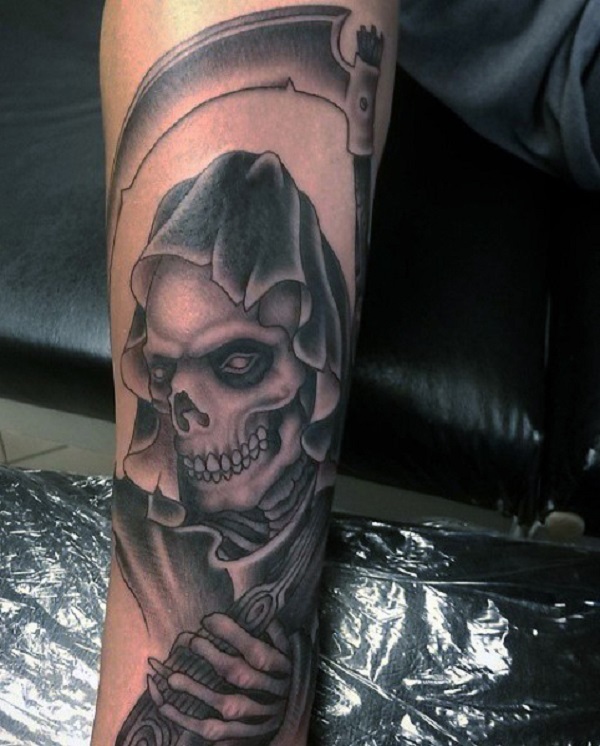 Grim Reaper tattoo in black ink. The reaper is seen to be staring directly into your should while standing on a pile of black clouds. The striking black color makes the reaper even more fearful. A more detailed Grim Reaper tattoo. Unlike the basic reaper costume that features a black cloak, the reaper here is seen to be wearing a torn cloak with jewels and chains clinging on to it. The scythe is also a bit shorter and also has jewels and chains on it. Grim Reaper tattoo with a smiling face. An evil smiling face or smirk is seen on the reaper as it carries its wooden scythe and off to hunt more souls. 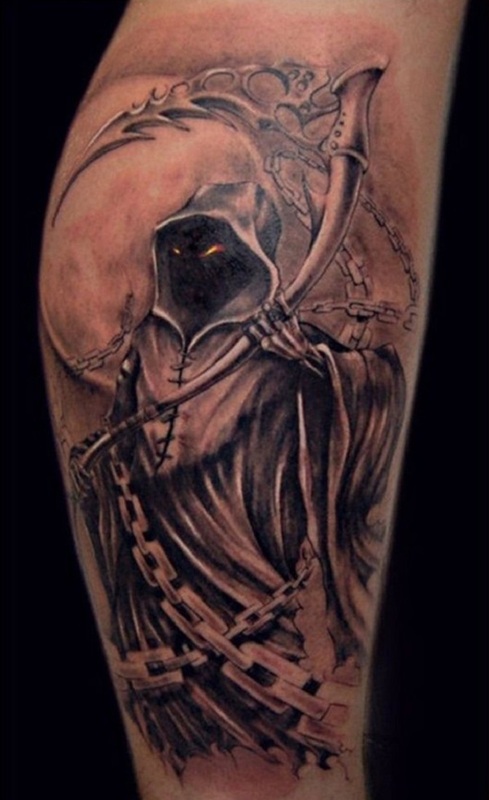 Faceless Grim Reaper tattoo. In a lot of designs the faceless reaper looks far more frightening and mysterious and it has its own appeal to others. A Grim Reaper tattoo in black ink. The reaper trudges through the skulls of the dead while carrying the scythe. 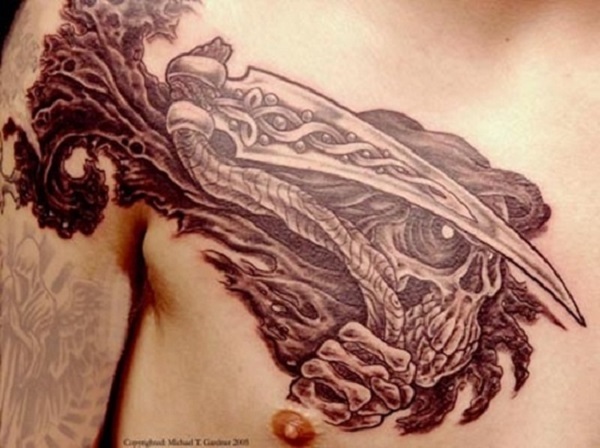 The reaper in this tattoo also has black wings on its back. 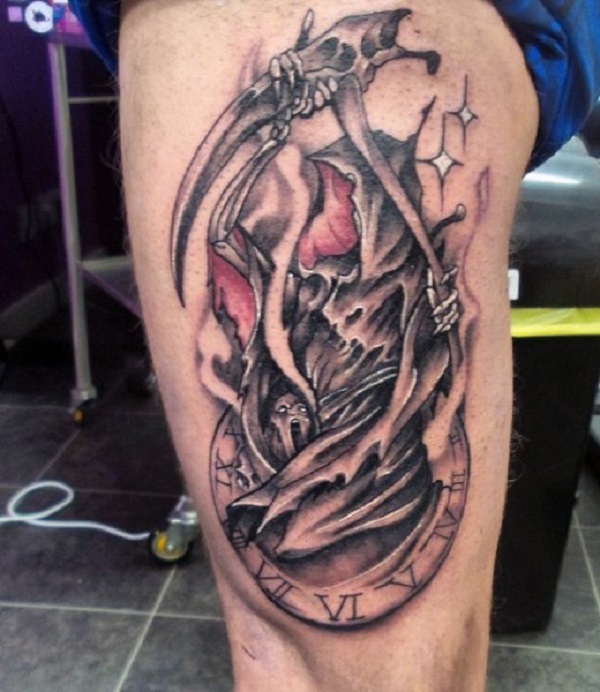 Another faceless Grim Reaper tattoo with a clock. The clock may signify the remaining time left before death as the reaper sweeps through and takes the soul along. Grim Reaper tattoo showing its face. The reaper is fully exposing its bony face as it holds on to the scythe and ready to claim more souls in the dead of the night. Grim Reaper tattoo by the neck. The reaper is shown heads up while crutching the wooden scythe and an hourglass by its side counting the remaining sands of time until a soul is taken away. A brightly colored Grim Reaper tattoo. An astonishing contrast to the usual dark reaper is his white reaper embracing the clouds and the sky and watching over a downtrodden path with dead trees. A smiling Grim Reaper tattoo. This is rather a happy depiction of the reaper as it beams with joy for the number of souls it’s going to take. The cloak is also colored in bright blue as well as part of the scythe. The Grim Reaper tattoo in red. The reaper holds its red scythe in front as if ready to slash someone’s soul right out of the body. The cloak also reveals part of the reaper’s body which is a bony and skeletal chest. Grim Reaper tattoo in black ink. The reaper is shown to be facing sideward as it holds in to the scythe. 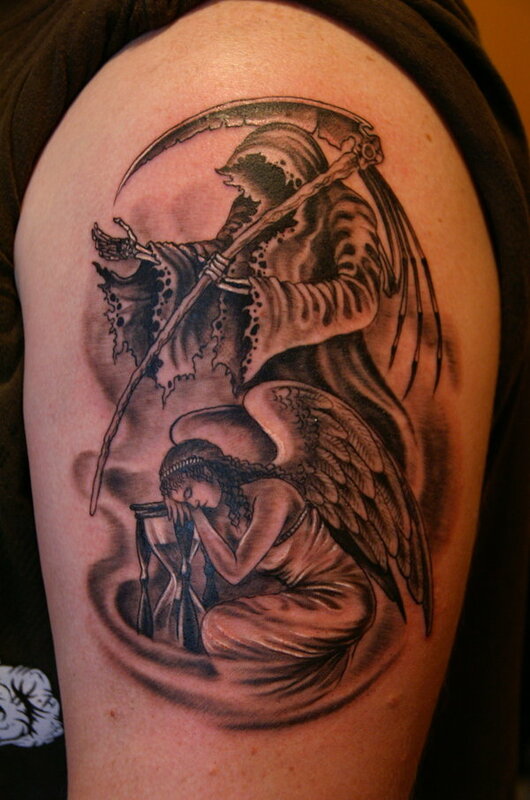 Contrasting Grim Reaper tattoo with an angel. The angel is seen to be hunched over to the hourglass as if protecting the sands of time while the reaper stands back and waits for the right moment to strike. Grim Reaper tattoo with bright red ink. The red ink on the tattoo represents both blood and the cloak of the reaper signifying physical and spiritual death at the same time. 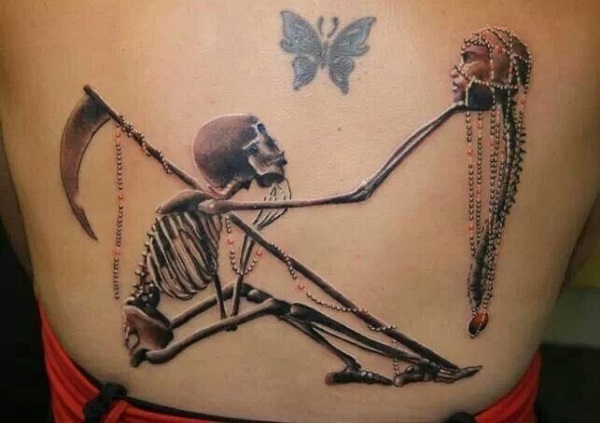 A unique female Grim Reaper tattoo. In contrast to the scary and skeletal depictions of the reaper, this version shows the reaper as possibly female, wearing a blue cloak with a scythe and with stockings and heels. Full Grim Reaper tattoo on the back. 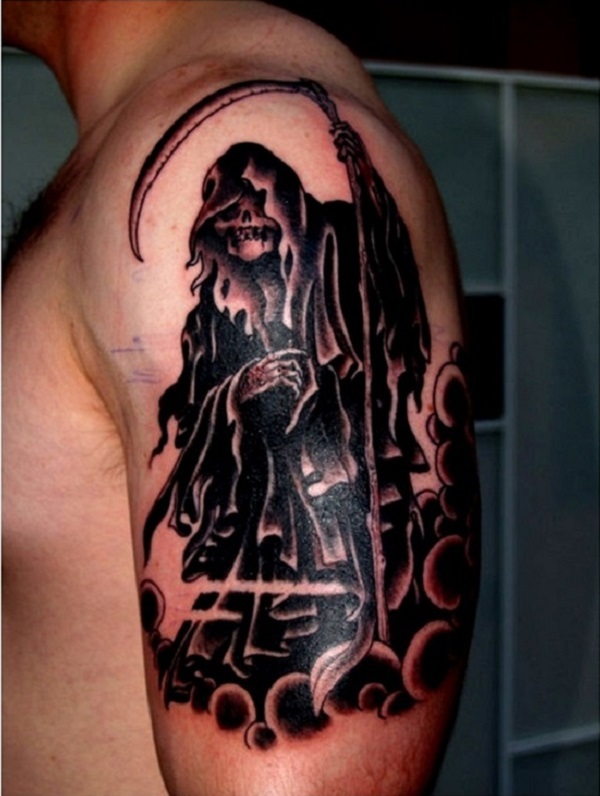 Inked in black, the tattoo shows the bony face of the reaper smiling happily while pointing towards its next victim. 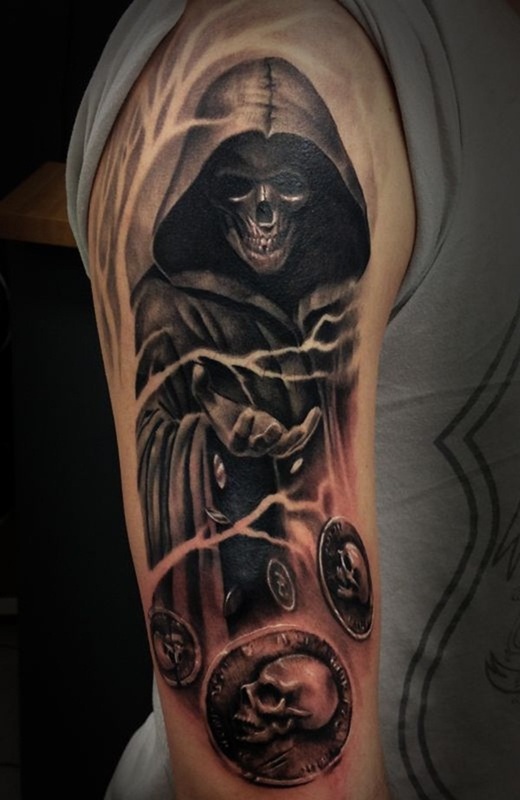 Grim Reaper tattoo with a unique twist. This is another creative version of the reaper where it doesn’t simply wear a cloth but a medieval armor complete with a sword and a horse shrouded with the skulls of the dead. A raven is also seen flying in a short distance. 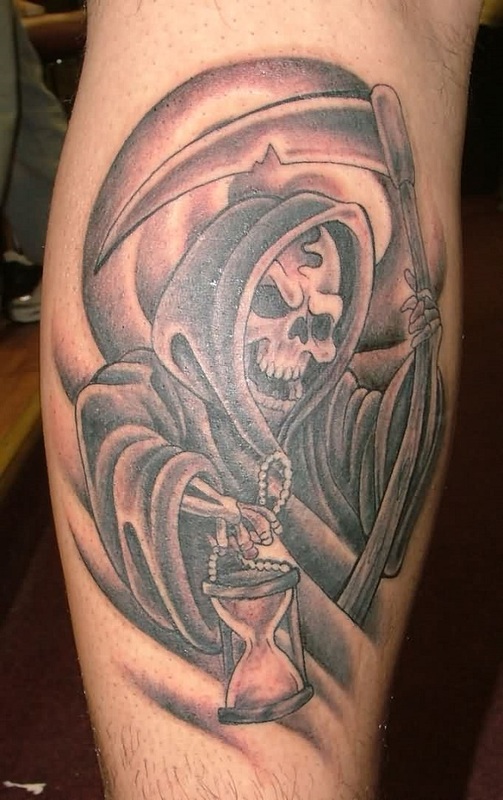 A frightening Grim Reaper tattoo. This design is truly heart pounding and can send the chills right up to your bone. The reaper is seen to be holding the scythe and sneering over you. 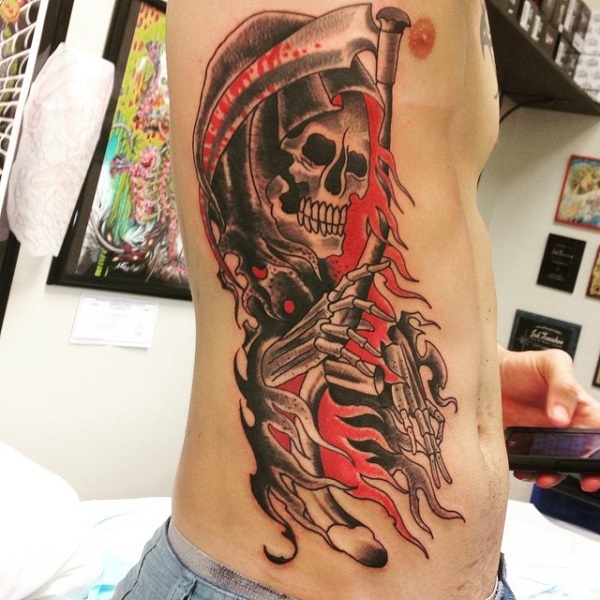 A rather unique portrayal of the Grim Reaper tattoo. The reaper holds a violin and is apparently playing it under a serene and quiet moonlight. 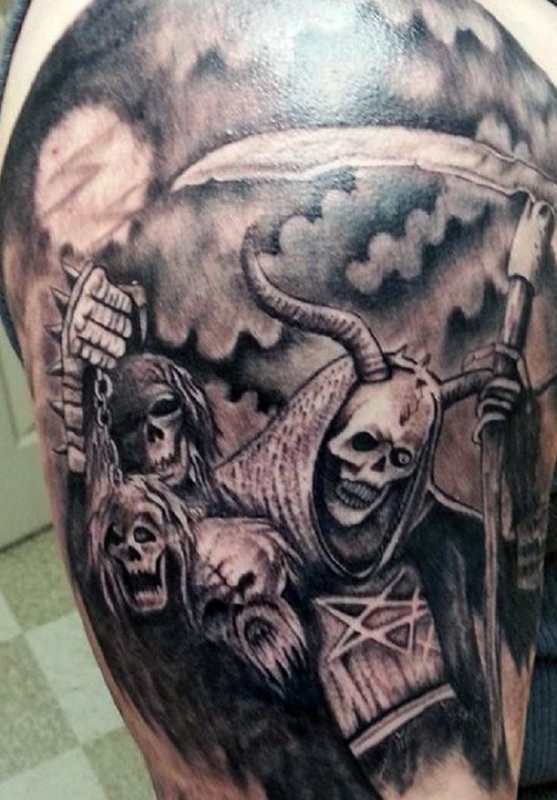 Grim Reaper tattoo with horns. In this depiction, the reaper is associated with evil and has horns as it carries along the skulls of the dead o one hand and the scythe on the other. Enthralling Grim Reaper tattoo. Drawing only the head the reaper is seen to be clutching the scythe as it looks onward to its next harvest of souls. 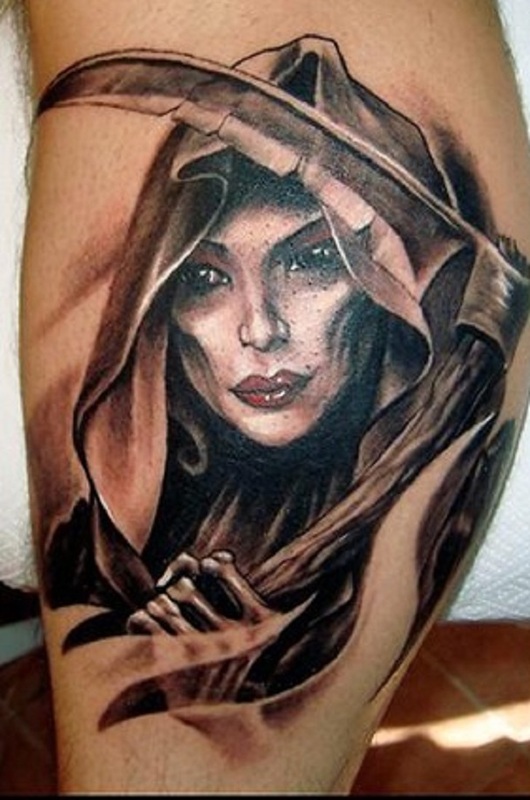 A woman Grim Reaper tattoo. In other depictions the reaper is also shown to be an astonishingly beautiful woman who can haunt dreams and claim souls. 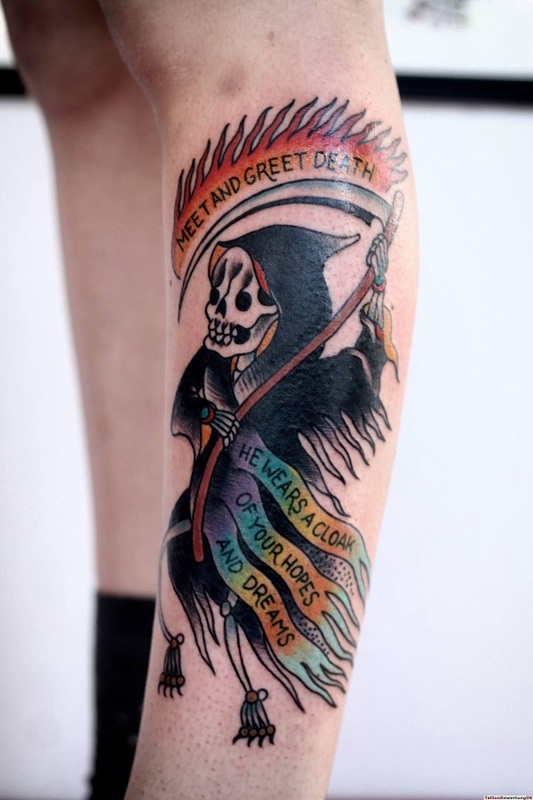 A rather bright and colorful Grim Reaper tattoo. The blood is seen to be dripping from the scythe but is at the same time the color of the inner cloak of the reaper. It is also painted brightly and boldly. 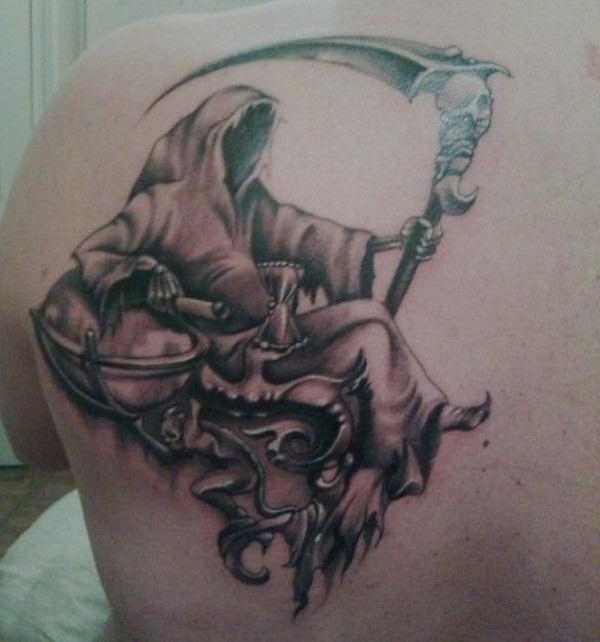 A full back Grim Reaper tattoo. Beautiful and well detailed at the same time. The reaper dons angel wings as it hides its face in the abyss as it is accompanied by two angel-like beings at the back. 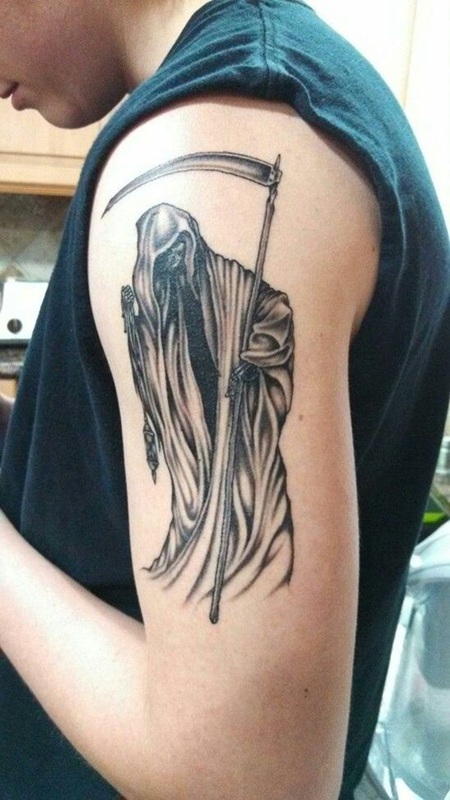 A lone and hauntingly disturbing Grim Reaper tattoo. The reaper walks along the woods with its scythe ready for another night of soul harvesting. 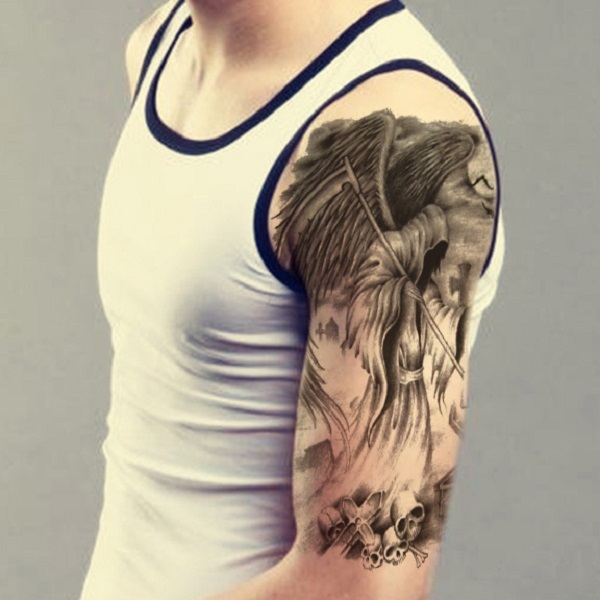 Grim Reaper tattoo with wings. The reaper has wings and is at the same time accompanied by a black raven. In its hands you can also see a clock for counting the remaining moments of souls that are about to die. 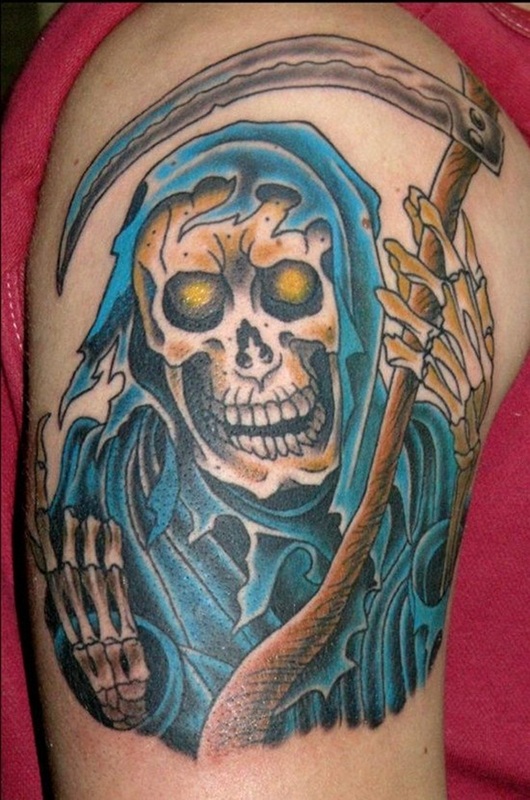 Another really colorful Grim Reaper tattoo. Nowadays colored reaper tattoos are getting more common and trendy. In this tattoo the colors are brighter and bolder. A smirking Grim Reaper tattoo. The reaper is seen to be holding an hour glass as if to delightfully count the remaining time of a soul in the land of the living. The Grim Reaper tattoo walking along the graves. 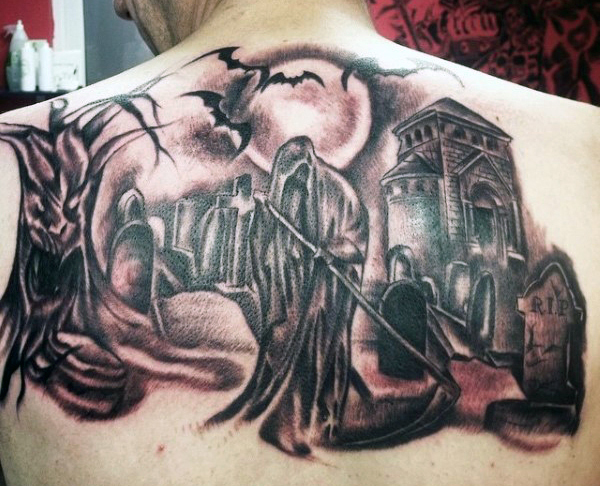 In this creepy and mysterious Grim Reaper tattoo, the reaper is seen to be accompanied by bats as it walks slowly amidst the bed of dead people. A mysterious Grim Reaper tattoo. The reaper seems to be throwing coins with skulls on them. It looks to be signifying that the reaper is tossing death wishes for the souls it’s about to take. 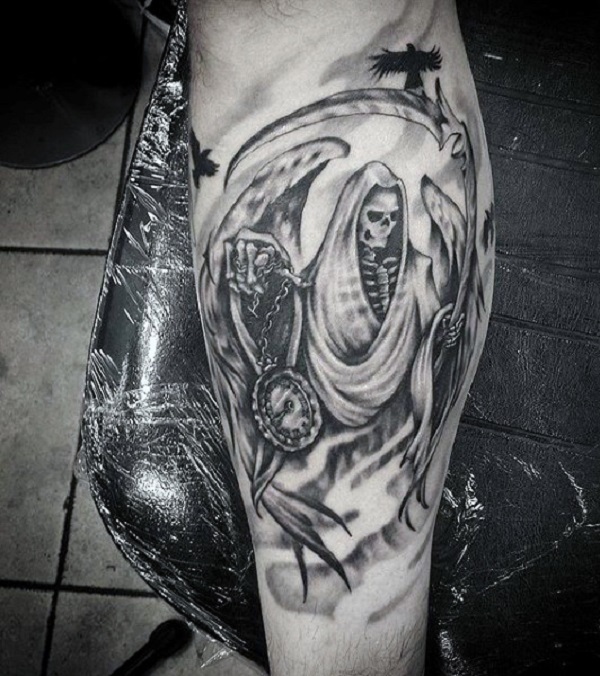 Grim Reaper tattoo with skeleton wings. Other depictions show the reaper with angel wings while on this design the wings are also in its bony appearance. 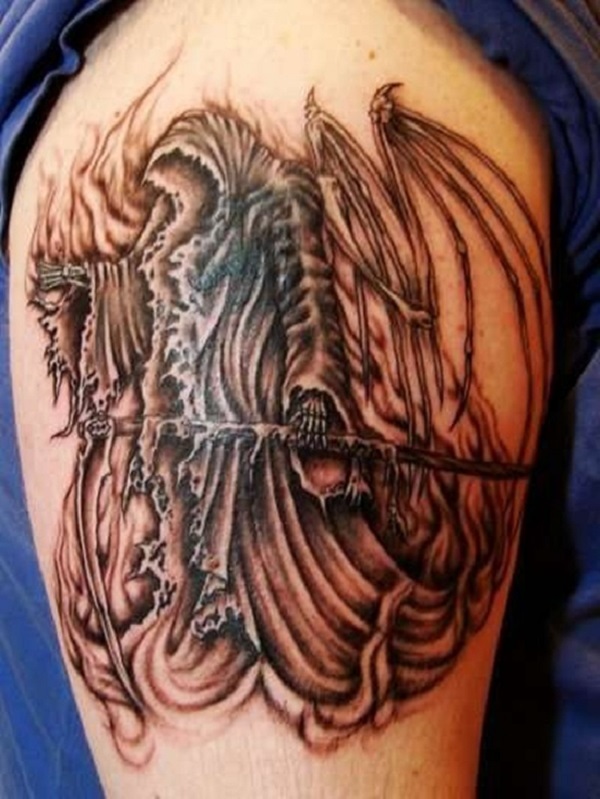 Another Grim Reaper tattoo having wings. The wings are seen to have only bones left just like the rest of the reaper’s body. The reaper is also represented as faceless and the shadow of the dead silently following him. 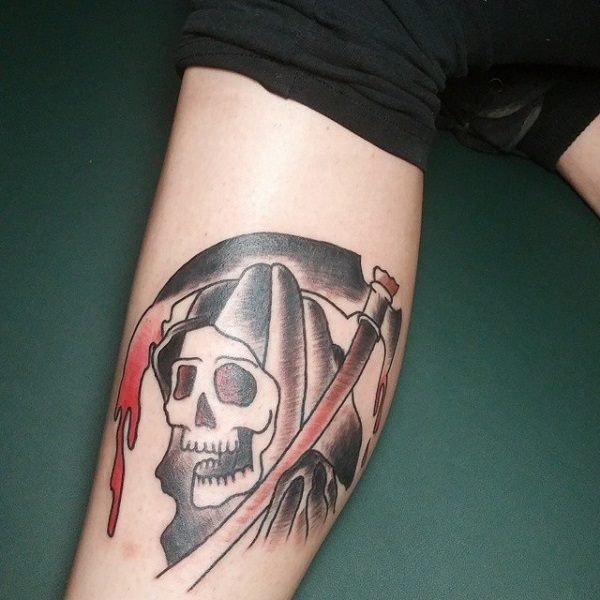 One of the lighter Grim Reaper tattoo by Justin Dion. The reaper is drawn rather cutely and even carries mutli-colored flags attached to the scythe. It seems to touch on the subject of death with humor. A Grim Reaper tattoo design by Mike Adams. The reaper is seen to be turning its back to the looker as it gently stalks away out of the spotlight. 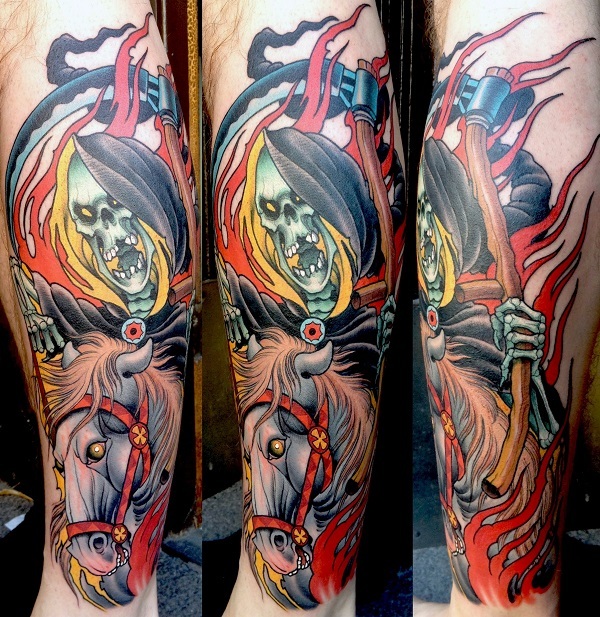 A very brightly colored Grim Reaper tattoo by Peter Largergren. The tattoo shows the reaper in full action and in dancing colors. In contrast to the darker appearance of the reaper, this one even has a white horse with golden hair. Another cutely design Grim Reaper tattoo this time in Philip Yarnell style. The way the reaper was drawn looks simple but amusing. 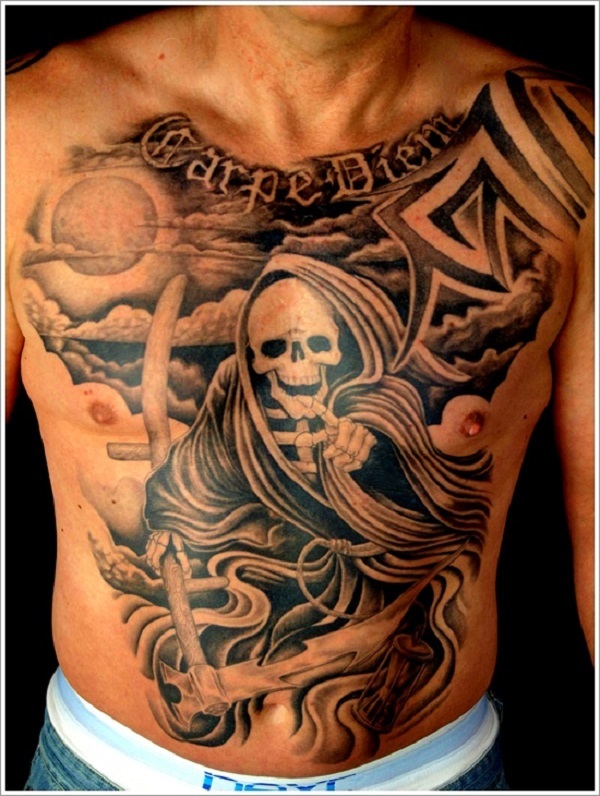 Creating a lighthearted view on death is what can be seen from the tattoo.